Juicy Couture has long shown their love of dogs in their cute Scotch Terrier logo. So it's no surprise to see this fun brand has designed a stylish handbag for carrying your favorite furry friend! 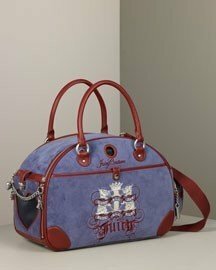 It's made from Juicy's famous blue Lady G velour trimmed in classic riot red leather. Silver charm pull tabs add the dose of bling we all expect from a Juicy Couture creation. The brand's signature Scottie Dog also makes an appearance with the fun slogan "Sleep All Day, Bark All Night." That sounds like a few puppies I know! The double zip-top closure makes it to easy to get your dog inside and out of his carrier. Front and side mesh cutouts allow your pampered pooch to see the outside world. But it's not all about what he wants. A side zippered pocket is spacious enough to carry your essentials too! Dual rolled handles sit comfortably in the palm of your hand, but they're not very practical for long distances. If you're planning to travel a long way, make sure you attach the webbed strap. This soft wide strap will feel heavenly on your shoulder, no matter how far you have to go!